Just minutes from happening Asheville, small-town America is alive and well on Main Street, Weaverville. The pace of life remains slow and sweet here, surrounded by country roads, spacious farmlands, verdant forests and mountain coves. Arrival by interstate is quick, or you can meander the slow roads. 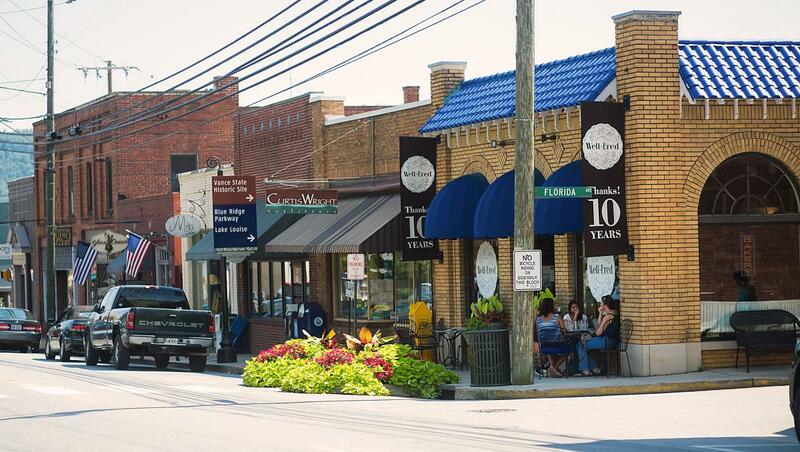 Incorporated in 1909, Weaverville existed as a community of farmers since the early 1800s long before it got its name. Records from 1803 indicate roads were being constructed in the area and ultimately the town would be named for one of the first settlers, John Weaver. Today the population hovers around 3,500. 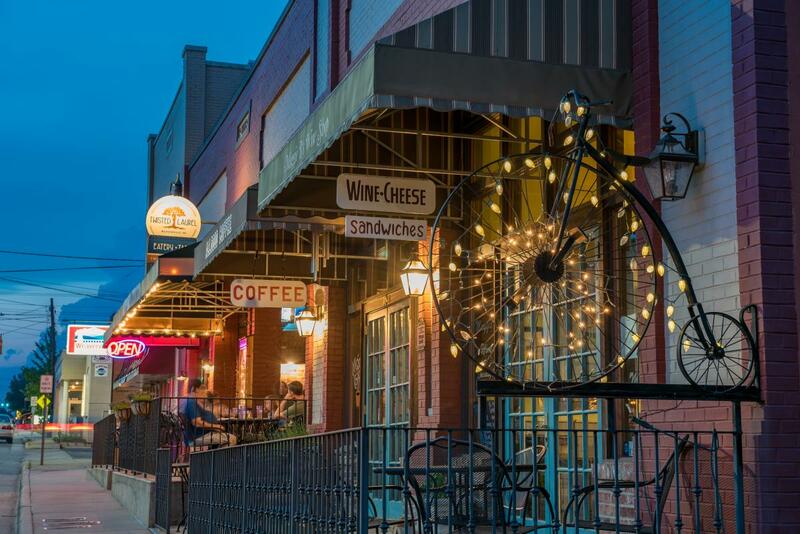 For its tiny downtown, Weaverville has abundant coffee and breakfast options. Allgood Coffee serves what it advertises — good, even exceptional coffee beverages (several brands are locally roasted.) The interior of high ceilings and raw brick walls adorned with work of local artisans vies for best space with the small sunny outside patio. Well-Bred Bakery, open over a decade in a beautiful corner space of arched windows and travertine floors (and once a pharmacy,) fills the niche of an elegant but homey European cafe. Its showcases burst forth with a fluffy French toast casserole, giant cookies (including gluten-free,) chocolate-enrobed éclairs the size of a fist, torts, truffles and other delights. Hunker down with a perfectly-drawn espresso and croissant sandwich, or savory salads, sides and soups for a light brunch or lunch. 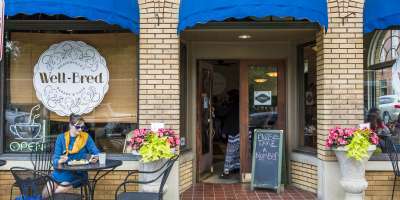 Creperie and Cafe of Weaverville offers a glorious outdoor patio and spacious dining room for crepes of every ilk — sweet and savory — and serves breakfast, lunch and dinner. The cafe is bisected by an antique shop, set up in small dining room vignettes. Shopping on Main Street can fill an afternoon. The Shop Around the Corner features a smart collection of delicate antique teacups, tea pots, and other tea ware. While you’re pouring over the antiques and newer home decor items, perfumes, lotions and locally-made jewelry, the owner kindly offers a sample of tea on a silver tray. Miya Gallery has long been known for its stunning local art glass, wood-turned vessels, landscape painting and hand-made jewelry by many local artists. The three owners often host artist-specific trunk shows on Saturdays. A few doors down is Mangum Pottery, run by second-generation potters who continue the family tradition of creating functional clay ware and vessels of beauty. The couple works from large-scale to small — featuring even large clock faces and coffee tables made of ceramics and wood, finished with unique textures and glazes. 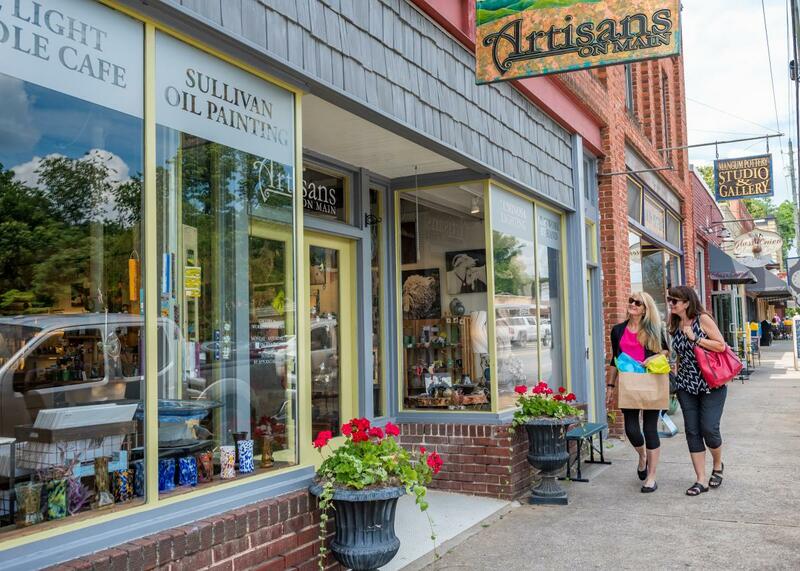 Art in Autumn and the semiannual Art Safari events, the former taking place on Main Street, the latter in artists’ studios in the surrounding countryside, showcase the many artisans working in a multitude of disciplines in the Weaverville area. Step into the charming Weaverville Library (continuous book sales will send you home with an armload of great reads) and also experience the Dry Ridge Historical Museum, which documents the life of the area’s first settlers dating back to 1787, in small collections of artifacts. Likewise the Vance Birthplace gives visitors a taste of near-pioneering life, where a five-room log house — reconstructed around original chimneys —and its outbuildings are furnished to evoke the historical period from 1795-1840. Zebulon Vance was a Civil War officer, North Carolina governor, and U.S. senator. Out this direction, find the 18-hole Reems Creek Golf course, open to visitors through the Reems Creek Golf Club. Make new personal history in the self-explanatory Navitat Zipline Canopy Adventures north of Weaverville. Round out an early evening (or buy your bottles of wine for tomorrow’s picnic) at Maggie B’s Wine and Specialty Store. Join the locals for a glass on the patio or in the wine bar, and Friday evenings mean a free themed wine-tasting. A full cheese counter, marinated olives, and deli-meats make this inspired culinary a must stop along the way.